Unwind in the comforts of the newly renovated Hilton Minneapolis. The AAA Four Diamond Hilton is conveniently connected via skyway to many attractions including shopping dining entertainment and the neighboring Minneapolis Convention Center. Nearby attractions include Nicollet Mall Target Field Target Center US Bank Stadium Guthrie Theatre and Mississippi Riverfront all within walking distance. Spacious guest rooms offer scenic views of downtown and reflect a sophisticated urban finish. All 821 guest rooms include Serenity beds in-room refrigerator laptop safe 50-inch high definition televisions coffee maker iron/iron board and complimentary in-room WiFi for all Hilton Honors Members. Other conveniences include FedEx Business Office spa services complimentary 24-hour fitness center indoor pool and sauna. The open lobby concept welcomes the world-traveler to indulge in lively offerings from Ten 01 Social our centrally situated bar and restaurant where the cooking is serious and the ambiance is decidedly social. Whether you*re having breakfast with colleagues lunch with clients or dinner and drinks with friends Ten 01 Social elevates the occasion with a menu that intrigues and service that soothes. For those on the go satisfy your appetite for the fresh and flavorful at Ten 01 Market our all-day destination for everything from Starbucks beverages to salads sandwiches and made-to-order pizzas. Ten 01 Market offers the provisions you need and variety you*ll love. Hilton Minneapolis offers 77 000 sq. ft. of versatile function space making it the perfect venue for conferences conventions and larger social events. Convene in the 25 000 sq. ft. Minneapolis Ballroom host a chic reception in The Gallery and outdoor patio or choose from one of the hotel*s 35 meeting rooms for any business or social event. 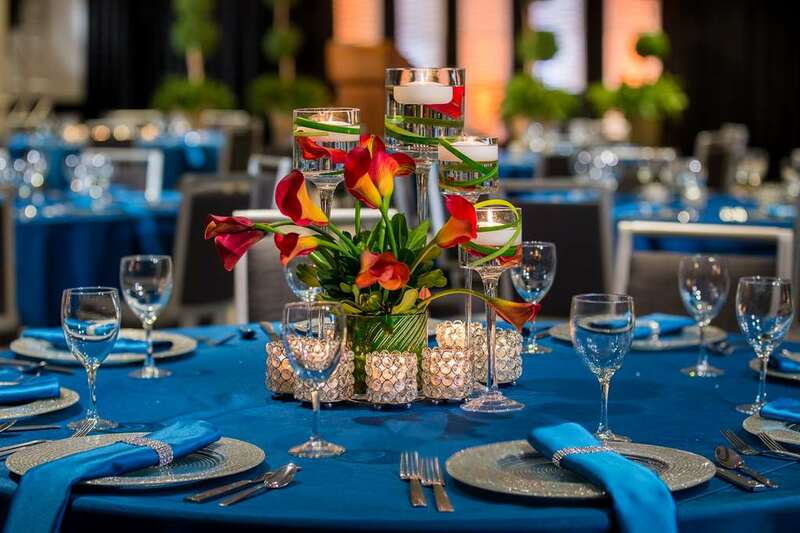 Relax and let one of our meeting professionals assist in organizing an event to remember. In-Room Dining: Unwind relax and enjoy luxurious dining in the comfort and privacy of your room or suite. Chef Beck*s menu features classics with a modern twist. Ten 01 Market: Satisfy your appetite for the fresh and flavorful at Ten 01 Market our all-day destination for everything from coffee and treats to salads sandwiches and made-to-order pizzas. Whether you grab a seat with us or nosh in your room Ten 01 Market offers the provisions you need and variety you*ll love.